Style interest from accessories rather than clothes ? Many of us focus on clothes with interesting style elements – each garment is different. The pattern companies encourage us in this, so we go on buying more patterns. And many of us like to make something ‘different’ each time we sew. But there’s a completely different approach to ‘looking interesting’. Janice of The Vivienne Files has one of her thought provoking pieces, on a ‘creative’ group of people who wear ultra-basic clothes, and add all the interest with accessories – scarves, hats, belts, jewellery, eyeglasses, gloves, socks, shoes. . .
Here’s her post. She picks a basic wardrobe to use as an ‘unnoticed’ background for interesting accessories. Emphasise the quality – this needn’t be a way of looking cheap and scruffy. 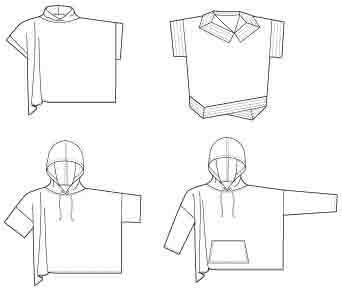 These base garments are very simple to copy. Cashmere to underline the quality. There’s a lot of poor quality cashmere in catalogues and on-line – feels worse than good merino wool. You do need to touch and handle it to find the good stuff. Only then do you understand why cashmere is such a prestige fibre. (Judith Rasband in a recent e-mail advocated classic denim shirts and relaxed fit white silk shirts as good additions to any wardrobe this season. Photos from J. Crew – of course you can get similar basics from many sources. 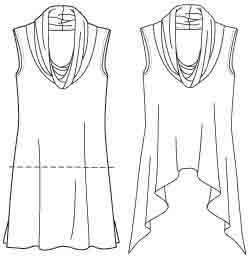 Even for the most basic styles, it’s a good idea to use recent patterns – for current proportions and shoulder shaping. Crew neck tee (instead use your most flattering neckline). Kwik Sew Kwik Start 3766. 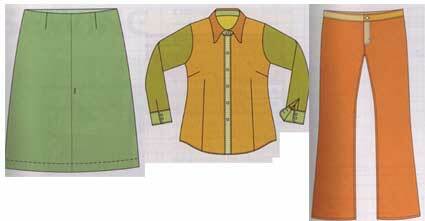 Palmer-Pletsch new unisex shirt (make a larger size with flapped chest pockets for a shirt jacket), McCall’s 6613. 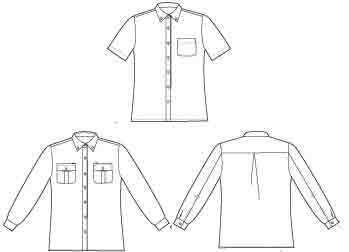 Many other shirt patterns available if you want something with a bit more individuality. 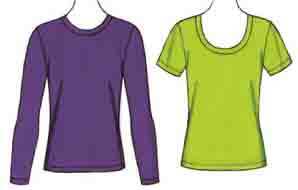 And many independent designers have tee/ shirt/ pant patterns with interesting details. But that isn’t the point here. These clothes are background – basics which don’t draw attention, so they don’t distract from the individual choice of accessories. 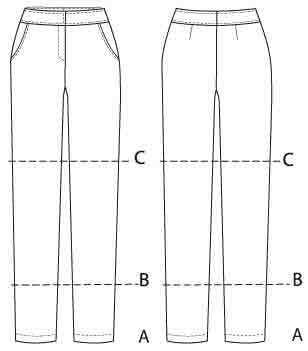 Slim pants and jeans, Butterick 5682. Or use Wendy Mullin’s Sew U and Sew U Home Stretch pattern books – she’s an example of a designer who aims for a ‘creative’ customer group. Her books are about being creative with clothes, but the starting points she gives are the most basic styles. Kwik Sew Kwik Start 3475 camp shirt. 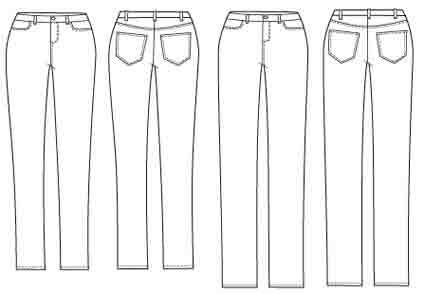 Kwik Sew Kwik Start 3314 elastic waist pants with side-seam pockets. Does this idea appeal ? or does the thought of having to wear such simple casuals appall you 😀 Don’t forget people using this approach look much more interesting than the clothes in the basic wardrobe, as they add their individual accessories. Getting style interest by wearing the simplest clothes and adding all the creativity in accessories is the opposite of all the books and independent patterns which tell you how to use a simple starting point to make a wide variety of clothes styles. 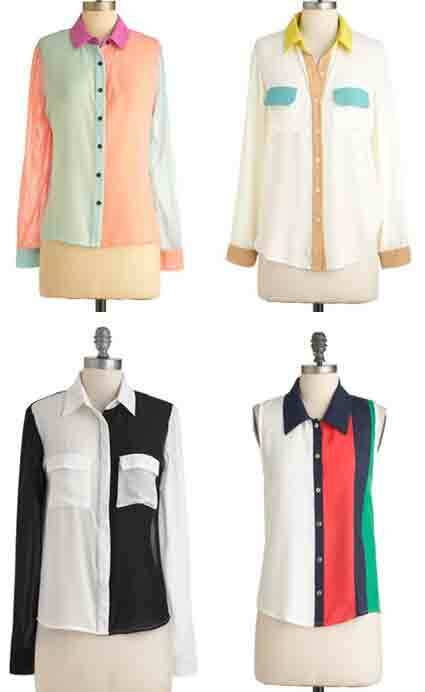 There are of course many ways of adding more variety to a small group of clothes. I have a post planned on some of them. Also very easy to change this clothing group to different personal styles, by changing the shirt-jacket to a more arty or prettier jacket style, or replacing it with a blazer. Post planned on this. If you do like this approach – what are your favourite accessories, to add interest to these very basic clothes ? I have a post planned about accessory styles. Well, are you an accessories person ? Have you got a closet full of bags, or shoes, hats, scarves, belts, gloves, statement jewellery. 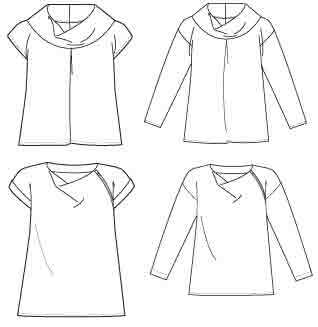 . . Would these simple garments be a way for you to build the most basic of wardrobe starting points, to use as background to all these exciting elements ? Wheee – 150 posts (since August 2009). As I don’t include huge photos, videos, music – I’ve only used 0% of my allocated blog storage space ! Efficiency habits go back not just to the days of dial-up connection, but 30 years ago to my first ever personal computer (a Commodore PET) which had 32k of memory and no hard drive. . .
I’ve been lazy about images. For lots of photos of runway styles, look at the Style.com (US Vogue) Trend Report for the a/w 2012 season. Also the UK Elle Trend Report. UK In Style has separate reports on each fashion city, if you want to be reminded that the fashion journalists pick out a small selection of possibilities from a huge variety of styles. Brocade is the season’s big idea for a patterned fabric. Fur used in unusual ways, such as sleeves or yokes only, or inset strips. geometric patterns with right angles. leopard and python animal skins. glued or sewn jewels or metal plates/ studs. Pant and skirt suits made with top and bottom in the same print/ non-classic weave. 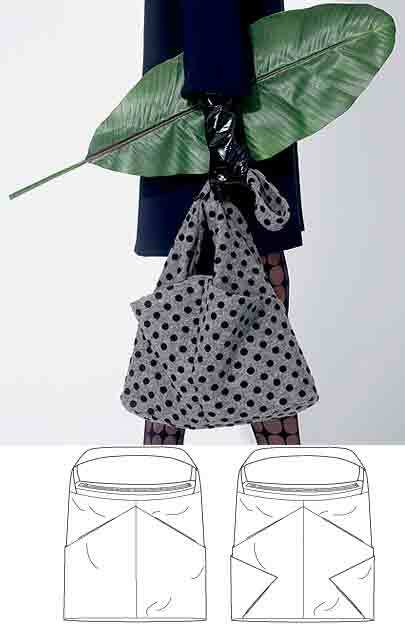 Or the opposite – make different sections of the garment in different prints. Red in all its shades, but especially berry, is the key colour for this season. Black leather and lace is neo-Goth. Silver, especially in accessories and hard-edged minimalist ‘futuristic’ clothes styles. Gold, especially in added baroque pattern. Waist emphasis – peplums, padded hips, waist belts from narrow to wide cinch. Jumpsuits – though just with a bib front as in overalls/ dungarees, not a complete top with back and sleeves. Military – browns, olives, or brights for colour. Equestrian – leather and high boots. Snoods, neck rings, fun fur scarves. Different fashion writers can pick out different themes. Here’s Angie of You Look Fab’s similar summary of the season. Here’s an update on Angie’s must-haves for this season. There’s a rather different selection of trends from Connie Crawford here. Here are Nancy Nix-Rice’s wearable ideas on the season’s trends. With lots of inspirational current outfit photos from her here. As usual, there are possibilities to suit many tastes. And not to worry – go your own way if nothing appeals ! 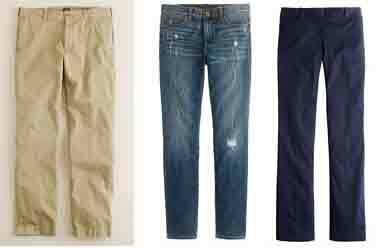 For more focus on casual clothes, it can help to look at the ‘resort’ collections. Actually, you can only impress people with your high style if they know the same fashion references. Perhaps your favourite ‘knowing elite’ is not clothes high spenders in expensive drawing rooms or on the red carpet, but top professionals, sports fans, vintage lovers, goths, gym users, cafe-bar party goers, people in the countryside, at art gallery openings, music festivals. Is that important to you ? Sorry about the lapse in posting, but completely unexpectedly I went into hospital at the beginning of July. It took about 6 weeks to get me sorted out and send me home, and I still have very little spare energy. I’m not expecting to go back to posting weekly – priorities have changed. I think I was getting a bit repetitive, and it’s amazing how much energy all those links and images take ! But I have a few finished but unpublished posts still in store, and no doubt will feel strongly about topics in future. . .
For example – I thought a jumper dress looked much more professional than a sheath dress on most body types. Well, a sheath dress that is anything but just right does not look professional at all ! It could be fun to look out modern jumper dress patterns. 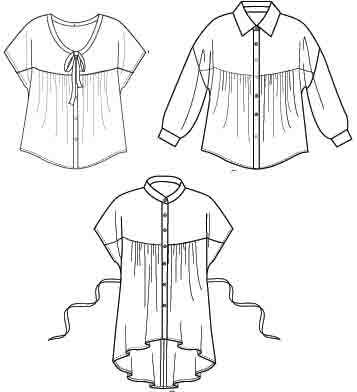 If you adapt another pattern, remember you need at least 1-2 inches/ 2.5-5 cm extra ease to layer over a top. And the armhole needs to be big enough not to crush the sleeve underneath. 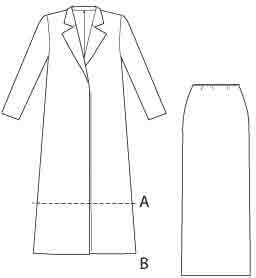 A close fitting sleeve looks slim, but a shirt sleeve is also current. In fact there’s a new Fashion Star shirt dress pattern, McCall’s 6600, if you want to look efficient and professional without a close fit. And there are all the other new BMV patterns to comment on. . .
I’m delighted to see that the number of visitors to my blog hasn’t dropped dramatically despite the lack of new posts, so it looks as if you find the material helpful for reference. Which I’m very pleased about. Will have to get round to devising a better index. . .
Best Wishes and thanks to you all for your interest.